August 31, 2018 at 11:04 am. Boise State bright blue has become the gold standard for Group of Five conference programs. Look no further than the sentiment emanating from the No. 22-ranked Broncos’ Week 1 opponent, Troy, for evidence. Through three different head coaching regimes, two different conference affiliations, and over 16 seasons, Boise State reached 10 wins 13 times. Last season’s 11-3 finish included the Broncos’ first Mountain West Conference championship since 2014 and was capped by a Las Vegas Bowl win over Oregon. Reaching such a level year after year is the benchmark Brown wants for his program. 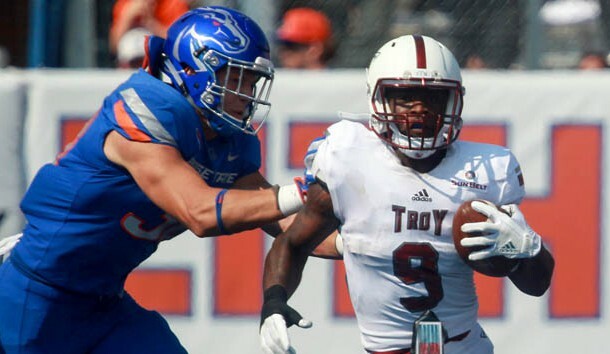 A win Saturday at Veterans Memorial Stadium in Troy, Ala., would go a long way in that direction for the Trojans — though they would need a few more years to catch up with the Broncos. The results have indeed been there, maintaining through cycles of eligibility, and from the transitions of coach Dan Hawkins to Chris Petersen, and Petersen to current head coach Bryan Harsin in 2014. Harsin coached Boise State to the Fiesta Bowl in his debut season, the first year of the College Football Playoff and the debut of the automatic New Year’s Six bowl bid for the highest-ranked Group of Five program. Boise State is a popular pick to land that berth again this season. Troy is a dark horse that, with a win on Saturday, could take a significant step toward that milestone in its recent growth as a program. Troy reached eight wins five times at the FBS level under longtime coach Larry Blakeney, for whom the university’s field is named. With a Top 25 ranking at one point in 2016, and last year’s 11-2 finish with a share of the Sun Belt Conference championship, the Trojans have enjoyed success in Brown’s four years leading the program. In addition to its total yardage yield of 337 per game, the Trojans’ 18.5-point per game allowance ranked No. 11 in the FBS. If anyone can appreciate Troy’s defense of a season ago, it’s Rypien. The Trojans held the Broncos to just 254 yards of total offense in last season’s defensive slugfest at Boise State, which the hosts won 24-13. “Their defense was especially good against us last year,” said Rypien, who finished 19 of 32 for 210 yards. He was also intercepted by Troy cornerback Blace Brown, who ran the pick back 53 yards. Blace Brown is one of those Trojans who stepped up in 2017. His interception of Rypien was the first of five, tied for 11th in the nation. Neal Brown called him an NFL-caliber performer, boasting an impressive combination of size, speed and awareness. Saturday presents Blace Brown individually, and Troy as a team, a prime opportunity to make a significant statement — not that it’s necessary to spark the Trojans. “There’s going to be no need for any (extra) motivation,” Blace Brown said.